Talent development from a consultative perspective provides a clear cause of performance gaps. Talent development initiatives may fulfill some organizational objectives, but long-term sustainability of these initiatives is an often overlooked variable. Applying the Surround Strategy Model to view incoming requests through four organizational lenses of culture, capability, commitment, and containment can mean the difference between simply offering training initiatives and creating real business impact. The Surround Strategy Model moves beyond a focus on initiative delivery and provides a robust framework to drive increased sustainability and impact. Many talent development professionals work diligently to align their work with business goals. At times, hasty reactions to “urgent” training requests can often derail the thoughtful consideration needed for prioritization and sustainability. This rush to fulfill requests can result in missed opportunities that demonstrate value to the organization. A performance consulting-based approach, first understanding barriers to performance and then addressing key leverage points, can drive sustainability and ensure impact. Employing the Human Performance Improvement (HPI) Model to help identify barriers to performance, applying governance to select the right initiative, and then using the Surround Strategy Model to drive adoption and sustainability, creates a synergistic formula for success. Moving organizational requests for training and development through governance ensures the right things get done. Viewing the approved initiative through the lens of culture, capability, commitment, and containment provides a rich opportunity to engage executive sponsors in thinking through how the initiative will be sustained and the impact measured. Working through cross-functional partnerships, success enablers like compensation, talent acquisition, competencies, and/or performance management can be leveraged. Greater business impact opportunities can be gained through this collaborative approach by creating partnerships between departments, such as executive sponsors, human resources business partners, talent acquisition, talent development, compensation, etc. Each of these functional areas have access to enablers that can be used to support the sustainability of the initiative. Sounds like common sense, so why isn’t this standard operating procedure for organizations? Oftentimes, talent development initiatives start based on a perception of need, rather than an adequate understanding of the real barriers to performance. For example, an executive makes a unilateral decision about the solution for fixing a “problem,” or perhaps there’s leftover budget available. Then, a learning leader feels compelled to show responsiveness to all requests by doing “something” to quickly address the requests. This unspoken sense of urgency results in skipping critical discovery and alignment work. The result is often inescapable, and a missed opportunity to provide business impact to the organization. A survey conducted during a 2015 webinar on implementing the Surround Strategy Model revealed 80 percent of talent development professionals agreed they were often reacting to a perception of needs, rather than true performance gaps. An executive requested a system training refresher due to the perception her team couldn’t effectively use the new software. Rather than taking a reactive approach by doing more training, it was recommended that a survey and targeted interviews should be used to understand user proficiency levels. The data indicated users felt the existing training was effective and felt reasonably proficient using the system. Also uncovered were several overly-complicated workflows as well as some functionality issues. The result of this setback? The IT department was tasked to resolve workflow and functionality issues, rather than talent development retraining hundreds of users. According to the whitepaper, The Value of Learning: Gauging the Business Impact of Organizational Learning Initiatives, “If learning activities are to positively affect organizational bottom lines, or even achieve high effectiveness, the strategies underlying them must tie to the specific results the organization seeks to achieve.” This sounds like common sense, yet the research found that only 44 percent of organizations confirmed use of business outcomes to drive learning strategy, revealing the tendency to forge ahead, reacting to perception of need or producing “feel good” initiatives. It’s an attitude of hoping for business impact rather than actual strategizing to drive impact. Why are training initiatives the “go-to” solution? Performance gaps are often due to a host of issues such as hiring for the wrong competencies, not clearly rewarding the right performance behaviors, weak frontline leaders or simply poor business processes. A more holistic approach that accounts for these multiple drivers including barriers and incentives to performance applied before designing initiatives, uncovers the real underlying issues and sets the stage for business impact. The HPI Model is an improvement over a plainly reactive approach and guides development by establishing a business case for performance improvement, linking specific strategic drivers to skill requirements, then working forward to design supporting initiatives—a solid framework to identify barriers to performance. What is not clearly defined using HPI is long-term, sustainability governance to prioritize initiatives, or assessment to understand if an organization is ready and able to accept and uphold initiatives. It also doesn’t fully address opportunities to use organizational enablers such as using goal setting within a performance management system to align and reward behaviors against specific performance criteria the initiative is meant to improve. The Surround Strategy Model builds on the HPI Model, viewing organizations as ecosystems, while delineating available enablers that executives, HR, talent development, and organizational development have to drive integration, accountability, sustainability and return on initiatives. Focusing on the right work, not just any work, is at the core of the Surround Strategy Model. Talent development from this consultative perspective provides a clearer view into the root cause of performance gaps. In addition, cross-functional governance offers a means for focusing on initiatives likely to have the highest organizational impact. The very nature of governance forces key stakeholders into alignment, increases buy-in and provides the support needed during implementation. Governance compels the separation of the “nice to haves” from the real business priorities. Culture: Will the organization’s culture be an aid or barrier to the initiative? Capability: Can leaders coach to the performance expectations of the initiative? What knowledge and skills will employees need to perform? Commitment: Will executives, sponsors and supervisors be committed long-term to doing what is necessary to support the performance expectations of the initiative? Are there competing priorities that may take focus away from this initiative? Containment: Is the scope of the initiative being adjusted to avoid overwhelming the organization? Critical to the surround strategy are enablers used with the intent to ensure sustainability and impact. Rather than training supervisors to drive compliance for conducting performance reviews, compensation could be used as an enabler. For example, applying a percentage of variable compensation aligned to a compliance metric, or applying the compensation enabler pushed compliance within one review cycle. Completion of mid-year reviews rose from 32 percent to 96 percent, and goals entered to the performance management system increased from 18 percent to 92 percent. Ultimately, talent development should be able to produce targeted, tangible gains through workforce performance improvement initiatives. This can come from better onboarding, increasing revenue, reducing errors or decreasing injuries. Unfortunately, talent management effectiveness is often based on a perception of contribution or responsiveness rather than actual value to the organization. 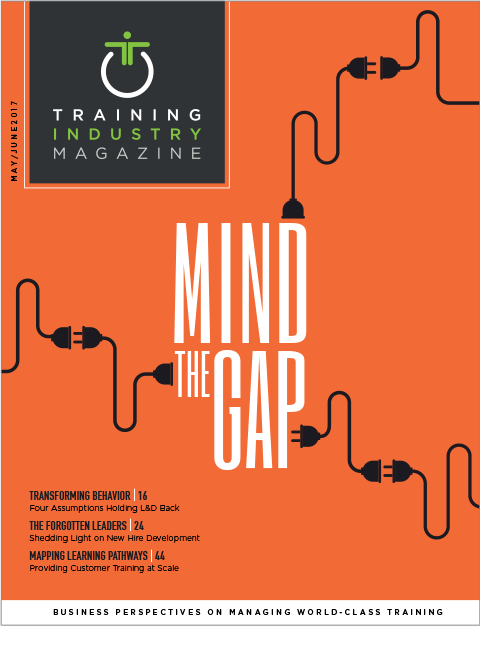 A whitepaper from Impact International found, “In a tough economic climate with unrelenting pressure on training budgets, L&D professionals are constantly challenged to demonstrate the value, ROI and business impact of training initiatives. The way to increase the value and return of training is to design it in a way that is clearly aligned with corporate strategy (i.e., to increase the relevance of training to the business need).” This sentiment makes clear definition of the gaps, alignment and prioritization of initiatives, and use of enablers for talent development initiatives to contribute value to the business critical. It was true in 2011 when the whitepaper was published and is more relevant than ever today. The Surround Strategy Model provides a simple framework for prioritizing, aligning, supporting, executing and sustaining organizational training initiatives that have a higher likelihood of adding long-term value to the business. It simply requires a shift in mindset to invest time to assess and prioritize the real needs of the organization, but is easy to set into motion and doesn’t require any specialized skills to get started. However, if done wrong, an initiative created in a vacuum could have negative financial impact to an organization, reduce the credibility and viability of the talent development function, and possibly cost jobs. Vince Eugenio, Ph.D., is a senior talent development expert with extensive experience in leading the function in Fortune 500 organizations. Karen Spataro Sieczka is a training and education manager for division of a Fortune 500 company that designs and manufactures inventory control hardware and software solutions.